The Ville is a nice place to stay and it's location is very handy for looking around Townsville. 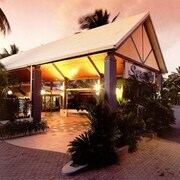 The friendliness of the staff combined with the lovely pool is worth coming to Townsville for. 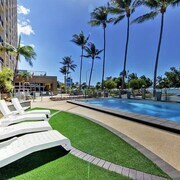 I stay at this hotel regularly when I come to Townsville and the staff are always friendly and helpful and the apartments are a decent size. 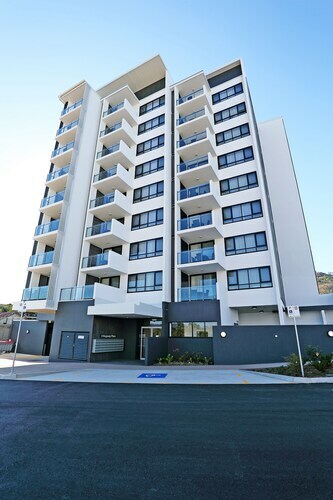 Apartment block is modern and in good condition and has everything one needs for a comfortable stay in Townsville, especially for longer stays. 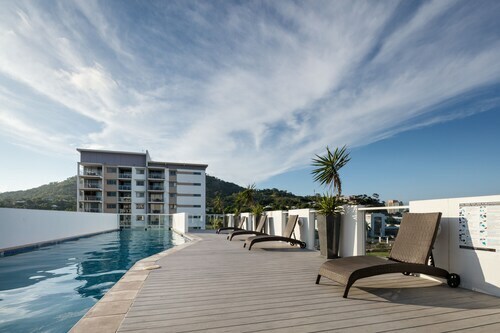 No surprises here, we have stayed several times in the past and have found it pleasant enough with standard affordable accommodation to suit our basic needs while visiting family in Townsville. Very clean and modern facility. Loved having the washer/dryer. That was helpful. View from balcony of car park building poor and made the apoartment a little dark. 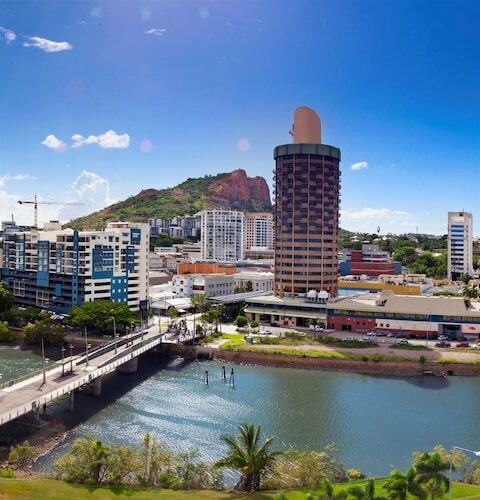 Townsville is a charming oceanfront city known for the hidden treasures lurking beneath its waters, which include sunken ships that make excellent diving sites and the Great Barrier Reef, one of the most important ecological jewels on the planet. Visitors to this bustling town on the north-eastern coast of Queensland will find plenty of sunshine, relaxing beaches, excellent water activities, great hiking, and a thriving nightlife. Start your vacation by visiting The Strand, a long strip of beach where you can relax the day away. Don’t forget the sunscreen! When you’re in the mood to get active, it’s time to take a dive or pull on your snorkelling mask. 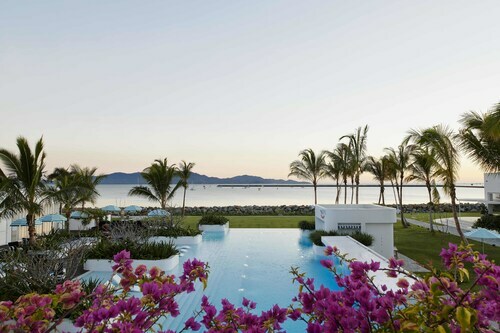 Townsville hugs the central section of the Great Barrier Reef, a must-see snorkel and dive spot. To learn even more about the reef, swing by Reef HQ, an awesome tropical aquarium that shows off the reef’s native flora and fauna. Also, add the Museum of Tropical Queensland to your list and check out relics from the HMS Pandora, a sunken British warship. Once you’ve had enough salt water, lace up your hiking boots. You can stop by the Billabong Sanctuary to take a gander at over 100 Australian species or climb the omnipresent Castle Hill, a huge monolith of pink granite that dominates the city’s skyline. At the top, you’ll get great views of the city and Cleveland Bay. Finally, if you yearn to answer the call of the wild, take a trip over to the large, neighbouring Magnetic Island and enjoy exploring its vast national park. After a long day, you’ll find plenty of friendly pubs willing to hand you a cold beer or tasty restaurants offering plates steeped in fresh seafood. Townsville knows how to treat its guests. You’ll find plenty of hotels to meet your budget, from spacious, 5-star accommodation in Townsville to motels and eco resorts. Couples can find plenty of charming bed and breakfast options, and those who want to live it up in style should consider renting a holiday home right on the beach. Travelling in a group? 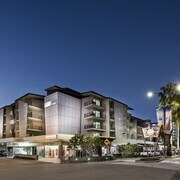 Family accommodation in Townsville is also very convenient. 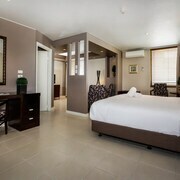 Wherever you’d like to rest your head, one of the hotels in Townsville QLD will be there to welcome you. Fly into the Townsville International Airport to get your vacation started. The airport handles both domestic and regional flights from most major cities in Australia, including Darwin, Brisbane, Sydney, and Melbourne. Once you land at the airport, it’s a good idea to rent a car in Townsville. The area is served by the Bruce Highway (A1) and Flinders Highway (A6). Bus and ferry services are available but somewhat irregular, so you might not want to count on them. You’ll find the heart of the city very pedestrian friendly, so bring your walking shoes! Just because vacation is the time to splurge doesn’t mean you want to overpay for your Townsville accommodation, flight, and rental car. Now you don’t have to. Just hop onto Expedia.co.nz to quickly compare prices for the hotels, flights, and rental cars you want. Get great deals, even with last minute bookings. 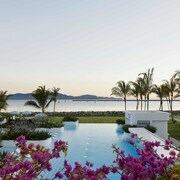 Explore Townsville with Expedia.co.nz’s Travel Guides to find the best flights, cars, holiday packages and more!